a operator can be projected on another one, for example, The orbital angular momentum cab be projected on the total angular momentum. I found that most of the book only talk part of it or present it separately. Now, I am going to treat it at 1 place. And I will give numerical value as well. the following context is on SI unit. a very central idea when writing down the state quantum number is, is it a good quantum number? a good quantum number means that its operator commute with the Hamiltonian. and the eigenstate states are stationary or the invariant of motion. the prove on the commutation relation will be on some post later. i don’t want to make this post too long, and with hyperlink, it is more reader-friendly. since somebody may like to go deeper, down to the cornerstone. but some may like to have a general review. the Hamiltonian of a isolated hydrogen atom is given by fews terms, deceasing by their strength. the Hamiltonian can be separated into 3 classes. is the Coulomb potential, which dominate the energy. recalled that the ground state energy is -13.6 eV. and it is equal to half of the Coulomb potential energy, thus, the energy is about 27.2 eV, for ground state. is the non-relativistic kinetic energy, it magnitude is half of the Coulomb potential, so, it is 13.6 eV, for ground state. = principle number. the energy level. = orbital angular momentum. this give the degeneracy of each energy level. it is reasonable to have 3 parameters to describe a state of electron. each parameter gives 1 degree of freedom. and a electron in space have 3. thus, change of basis will not change the degree of freedom. The mathematic for these are good quantum number and the eigenstate is invariant of motion, will be explain in later post. But it is very easy to understand why the angular momentum is invariant, since the electron is under a central force, no torque on it. and the magnetic angular momentum is an invariant can also been understood by there is no magnetic field. the principle quantum number is an invariance. because it is the eigenstate state of the principle Hamiltonian( the total Hamiltonian )! the center of mass also introduced to make more correct result prediction on energy level. but it is just minor and not much new physics in it. = principle quantum number does not affected. = magnetic total angular momentum. = spin angular momentum. since s is always half for electron, we usually omit it. since it does not give any degree of freedom. at this stage, the state can be stated by , which shown all the degree of freedom an electron can possible have. an eigenstate can be stated as . in spectroscopy, we denote it as , where is the spectroscopy notation for . there are 5 degrees of freedom, but in fact, s always half, so, there are only 4 real degree of freedom, which is imposed by the spin ( can up and down). the reason for stating the s in the eigenstate is for general discussion. when there are 2 electrons, s can be different and this is 1 degree of freedom. 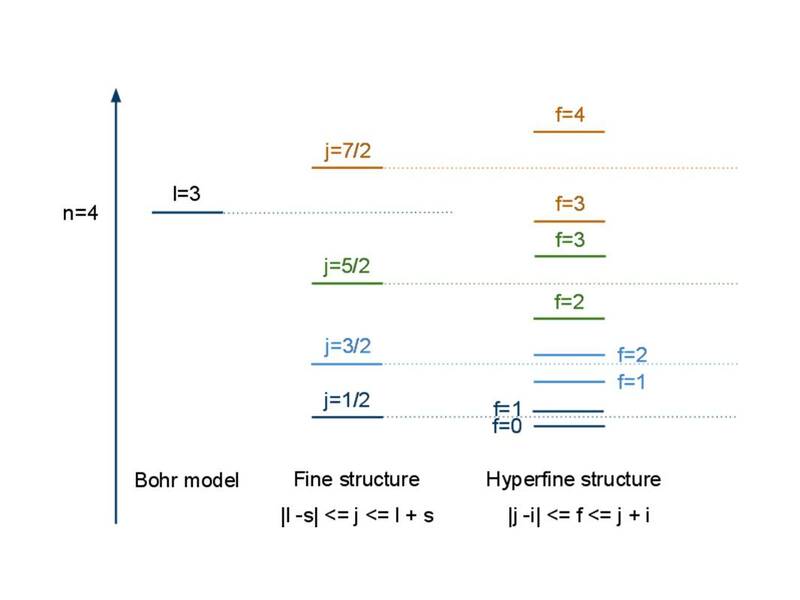 the hyperfine structure always makes alot questions in my mind. the immediate question is why not separate the orbital angular momentum and the electron spin angular momentum? why they first combined together, then interact with the nuclear spin? may be i open another post to talk about. = electron spin angular momentum. = spin-orbital angular momentum of electron. = nuclear spin. for hydrogen, it is half. a quantum state is $\left| n, l, s, j,i, f , m_f \right>$. but since the s and i are always a half. so, the total degree of freedom will be 5. the nuclear spin added 1 on it. this term is for the volume shift. the magnitude is . the angular momentum has 2 kinds – orbital angular momentum , which is caused by a charged particle executing orbital motion, since there are 3 dimension space. and spin , which is an internal degree of freedom to let particle “orbiting” at there. thus, a general quantum state for a particle should not just for the spatial part and the time part. but also the spin, since a complete state should contains all degree of freedom. where the 1 with L is the identity of the spin-space and the 1 with S is the identity of the 3-D space. the above was discussed on J.J. Sakurai’s book. the mathematics of and are completely the same at rotation operator. where can be either or . the can only have integral value but can be both half-integral and integral. the half-integral value of makes the spin-state have to rotate 2 cycles in order to be the same again. but the c is very small, but if we can rotate the state for a very large angle, the effect of it can be seen by compare to the rotation by spin. the experiment can be done as follow. we apply a rotating magnetic field at the same frequency as the Larmor frequency. at a very low temperature, the spin was isolated and and is equal to . the different in the c will come up at very long time measurement and it exhibit a interference pattern. if is a complex number, it will cause a decay, and it will be reflected in the interference pattern. if we find out this c, then we can reveal the other spacial dimension! the problem is. How can we act the orbital angular momentum on the spin with out the effect of spin angular momentum? since L and S always coupled. one possibility is make the S zero. in the system of electron and positron. the total spin is zero. another possibility is act the S on the spatial part. and this will change the energy level. is due to the operators are commute to each other. by why? if we break down the L in to position operator x and momentum operator p, the question becomes, why x and S commute or p and S commute? i will prove it later. For any vector operator, it must satisfy following equation, due to rotation symmetry. so, L, S is not commute.